MARKETING ACTUARY: Why Do Brian Tracy and Stephen Covey use Overhead Transparencies? Why Do Brian Tracy and Stephen Covey use Overhead Transparencies? 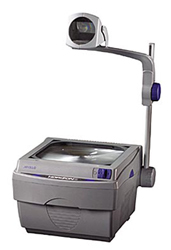 An overhead projector? That's what Brian Tracy used when I saw him last. You know, where you write on clear plastic transparencies. This came as a surprise. At previous keynotes, he just spoke. I've never used overheads. No one does. That's not quite true. Stephen Covey, author of The Seven Habits of Highly Effective People, did the last three times I've seen him. Live drawings create a sense of anticipation. Energy. Spontaneity. You see a creation made right before your eyes. Much more powerful than the usual prepared PowerPoint presentations. Though "old-fashioned", an overhead provides an elegant solution. You face the audience, which makes you easy to hear, your drawings fill the illuminated screen, you have a canvas the size of an 8.5"x11" page. Even colours like red stand out. The transparencies give an record of your session. Granted, flipcharts do too, but try photocopying them. Your pens can still dry out, though. Maybe getting ink on your hands is a problem too. Few meeting rooms have overhead projectors for transparencies anymore. Too bad. We've lost something. Such is progress.